International Translation Day is celebrated every year on 30 September on the feast of St. Jerome, (Eusebius Sophronius Hieronymus) the Bible translator, priest, confessor, theologian, and historian, who is considered the patron saint of translator after translating most of the Bible into Latin (the translation that became known as the Vulgate), and making commentaries on the Gospels, who died 30 September 420. He was born at Stridon around 347 A.D. He was of Illyrian ancestry and his native tongue was the Illyrian dialect. He was not baptized until about 360–366 A.D., when he had gone to Rome with his friend Bonosus (who may or may not have been the same Bonosus whom Jerome identifies as his friend who went to live as a hermit on an island in the Adriatic) to pursue rhetorical and philosophical studies. He studied under the grammarian Aelius Donatus. There Jerome learned Latin and at least some Greek, though probably not the familiarity with Greek literature he would later claim to have acquired as a schoolboy. As a student in Rome, he engaged in the superficial escapades and homosexual behaviour of students there, which he indulged in quite casually but for which he suffered terrible bouts of guilt afterwards. To appease his conscience, he would visit on Sundays the sepulchres of the martyrs and the Apostles in the catacombs. The protégé of Pope Damasus I, Jerome was known for his teachings on Christian moral life, especially to those living in cosmopolitan centers such as Rome. In many cases, he focused his attention on the lives of women and identified how a woman devoted to Jesus should live her life. This focus stemmed from his close patron relationships with several prominent female ascetics who were members of affluent senatorial families. He is recognised as a Saint and Doctor of the Church by the Catholic Church, the Eastern Orthodox Church, the Lutheran Church, and the Anglican Communion. Jerome used a quote from Virgil—”On all sides round horror spread wide; the very silence breathed a terror on my soul” to describe the horror of hell. Jerome initially used classical authors to describe Christian concepts such as hell that indicated both his classical education and his deep shame of their associated practices, such as pederasty which was found in Rome. Although initially skeptical of Christianity, he was eventually converted After several years in Rome, he travelled with Bonosus to Gaul and settled in Trier where he seems to have first taken up theological studies, and where he copied, for his friend Tyrannius Rufinus, Hilary of Poitiers’ commentary on the Psalms and the treatise De synodis. Next came a stay of at least several months, or possibly years, with Rufinus at Aquileia, where he made many Christian friends. Some of these accompanied him when he set out about 373 on a journey through Thrace and Asia Minor into northern Syria. At Antioch, wo of his companions died and he himself was seriously ill During one of these illnesses (about the winter of 373–374), he had a vision that led him to lay aside his secular studies and devote himself to God. He began studying the Bible, under the impulse of Apollinaris of Laodicea. Then went to the desert of Chalcis, to the southeast of Antioch, known as the “Syrian Thebaid”, from the number of hermits inhabiting it, to study and write and learn Hebrew under the guidance of a converted Jew; and corresponded with Jewish Christians in Antioch. He has the Hebrew Gospel, preserved in his notes, and is known today as the Gospel of the Hebrews, and which the Nazarenes considered to be the true Gospel of Matthew which he translated into Greek. He returned to Antioch in 378 or 379, he was ordained by Bishop Paulinus. Soon afterward, he went to Constantinople to study Scripture under Gregory Nazianzen. By 385 he returned toRome, as secretary to Pope Damasus I. Jerome accompanied one of the claimants, Paulinus back to Rome during the Schizm of Antioch in order to get more support for him, and distinguished himself to the pope, and took a prominent place in his councils. While in Rome, he revised the Latin Bible, basing it on the Greek manuscripts of the New Testament. He also updated the Psalter containing the Book of Psalms. In Rome he was surrounded by a circle of well-born and well-educated women, including some from the noblest patrician families, such as the widows Lea, Marcella and Paula, with Paula’s daughters Blaesilla and Eustochium. Jerome’s unsparing criticism of the secular clergy of Rome, brought a growing hostility against him among the Roman clergy and their supporters and Soon after the death of his patron Damasus (10 December 384), Jerome was forced to leave his position at Rome despite this His letters were widely read and distributed throughout the Christian empire. Additionally, his condemnation of Blaesilla’s hedonistic lifestyle in Rome led her to adopt ascetic practices, which affected her health and worsened her physical weakness until she died Outraging many of the Roman populace. In August 385, he left Rome for good and returned to Antioch, accompanied by his brother Paulinian and several friends, including Paula and Eustochium. The pilgrims, joined by Bishop Paulinus of Antioch, visited Jerusalem, Bethlehem, and the holy places of Galilee, and then went to Egypt. At the Catechetical School of Alexandria, Jerome listened to the catechist Didymus the Blind expounding the prophet Hosea and telling his reminiscences of Anthony the Great. Amply provided by Paula with the means of livelihood and of increasing his collection of books, he led a life of incessant activity in literary production. To these last 34 years of his career belong the most important of his works; his version of the Old Testament from the original Hebrew text, the best of his scriptural commentaries, his catalogue of Christian authors, and the dialogue against the Pelagians. Jerome died near Bethlehem on 30 September 420. The date of his death is given by the Chronicon of Prosper of Aquitaine. His remains, originally buried at Bethlehem, are said to have been later transferred to the basilica of Santa Maria Maggiore in Rome. The late, great Marc Bolan, English singer/songwriter musician with Glam Rock band T.Rex was Born September 30th 1947. T. Rex were originally Formed in 1967 as Tyrannosaurus Rex, After a solitary performance as a four-piece the group immediately broke up. Bolan retained the services of percussionist Steve Peregrin Took and the duo began performing acoustic material. The combination of Bolan’s acoustic guitar and distinctive vocal style with Took’s bongos and assorted percussion earned them a devoted following in the thriving hippy underground scene which included the late great BBC Radio One Disc jockey John Peel who championed the band early in their recording career. By 1968, Tyrannosaurus Rex had become a modest success on radio and on record, and had released three albums. While Bolan’s early material was rock and roll-influenced pop music, he was also writing dramatic and baroque songs with lush melodies and surreal lyrics filled with Greek and Persian mythology as well as creations of his own. After Bolan replaced Took with percussionist Mickey Finn, they completed A Beard of Stars. As well as progressively shorter titles, Tyrannosaurus Rex’s albums began to show higher production values, more accessible songwriting and experimentation with electric guitars and a true rock sound. The breakthrough came with “King of the Rumbling Spires” which used a full rock band. The group’s next album, T. Rex, continued the process of simplification by shortening the name, and completed the move to electric guitars. The new sound was more pop-oriented, They released the first single, “Ride a White Swan”, in late 1970 and was followed by a second single, “Hot Love”. Before one performance Mickey Finn’s girlfriend Chelita Secunda add two spots of glitter under Bolan’s eyes before an appearance on Top of the Pops, the ensuing performance would often be viewed as the birth of glam rock which gained popularity in the UK and Europe during 1971–72. In 1971, T. Rex released their second album Electric Warrior which contained one of their best-known song, “Get It On”. and is Often considered to be their best album. it became a top ten hit in the US, where the song was retitled “Bang a Gong (Get It On)” to distinguish it from a 1971 song by the group Chase. However, the album still recalled Bolan’s acoustic roots with ballads such as “Cosmic Dancer” and the stark “Girl” & brought much commercial success to the group, & the term “T. Rextasy” was coined as a parallel to Beatlemania to describe the group’s popularity. Along with David Bowie’s early hits, “Get It On” was among the few British glam rock songs that were successful in the US. This was followed by more glam rock hits during the 1970′s including “Jeepster”, “20th Century Boy”, “Children of the Revolution”, “Hot Love”, “Telegram Sam”, and “Metal Guru”. The next album Tanx (1973) was full of melancholy ballads and rich production, And showcased the T. Rex sound bolstered by extra instrumental embellishments such as Mellotron and saxophone. During the recording T. Rex members began to quit, starting with Bill Legend in November 1973. Legend felt alienated by Bolan’s increasingly egotistical behaviour, which was fed by success, money, cocaine, and brandy.the following album Zinc Alloy and the Hidden Riders of Tomorrow was released on 1 February 1974, and reached number 12 in the UK. 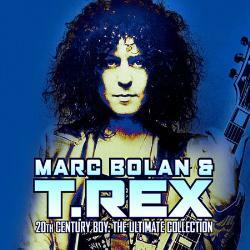 The album harkened back to the Tyrannosaurus Rex days with long song-titles and lyrical complexity, Bolan’s Zip Gun (1975) was self-produced by Bolan who, in addition to writing the songs, gave his music a harder, more futuristic sheen. The final song recorded with Visconti, “Till Dawn”, was re-recorded for Bolan’s Zip Gun with Bolan at the controls. T. Rex’s penultimate album, Futuristic Dragon (1976), featured a schizophrenic production style that veered from wall of sound-style songs to nostalgic nods to the old T. Rex boogie machine. In the summer of 1976, T. Rex released two more singles, “I Love to Boogie” and “Laser Love”, In early 1977 Dandy in the Underworld was released to critical acclaim and the band experienced something of a resurgence. Sadly though Marc Bolan was tragically killed 16 September 1977 after his purple Mini 1275GT crashed into a tree after failing to negotiate a small humpback bridge in, southwest London. However T. Rex vastly influenced the glam rock, punk rock and Britpop genres. Johnny Marr of The Smiths stated: “The influence of T. Rex is very profound on certain songs of the Smiths like “Panic” and “Shoplifters of the World Unite”. T. Rex are specifically referenced by The Who in the lyrics of their 1981 hit song “You Better You Bet”, by David Bowie in the song “All the Young Dudes” (which he wrote for Mott the Hoople), by B A Robertson in his 1980 hit “Kool In The Kaftan”, and by the Ramones in their song “Do You Remember Rock ‘n’ Roll Radio?” The early acoustic material was influential in helping to bring about progressive rock and 21st century folk music-influenced singers. The lyric “Glimmers like Bolan in the shining sun” is featured in My Chemical Romance’s song “Vampire Money”, a direct reference to Bolan, taken from their most recent studio album Danger Days: The True Lives of the Fabulous Killjoys. Additionally, Oasis “borrowed” the distinct guitar riff from “Get It On” on their single “Cigarettes and Alcohol”. Noel Gallagher, has also cited T. Rex as a strong influence. The Boeing 747 was First flown commercially in 1970, and held the passenger capacity record for 37 years. The four-engine 747 uses a double deck configuration for part of its length. It is available in passenger, freighter and other versions. Boeing designed the 747’s hump-like upper deck to serve as a first class lounge or (as is the general rule today) extra seating, and to allow the aircraft to be easily converted to a cargo carrier by removing seats and installing a front cargo door. Boeing did so because the company expected supersonic airliners (development of which was announced in the early 1960s) to render the 747 and other subsonic airliners obsolete, while the demand for subsonic cargo aircraft would be robust well into the future. The Boeing/ Hughes AH-64 Apache helicopter first flew on 30 September 1975. The Boeing AH-64 Apache is a four-blade, twin-engine attack helicopter with a tailwheel-type landing gear arrangement, and a tandem cockpit for a two-man crew. Originally, the Apache started life as the Model 77 developed by Hughes Helicopters for the United States Army’s Advanced Attack Helicopter program to replace the AH-1 Cobra, and was first flown on 30 September 1975. The AH-64 was introduced to U.S. Army service in April 1986. The AH-64 Apache features a nose-mounted sensor suite for target acquisition and night vision systems. It is armed with a 30-millimeter (1.2 in) M230 Chain Gun carried between the main landing gear, under the aircraft’s forward fuselage. It has four hardpoints mounted on stub-wing pylons, typically carrying a mixture of AGM-114 Hellfire missiles and Hydra 70 rocket pods. The AH-64 has a large amount of systems redundancy to improve combat survivability. The U.S. Army selected the YAH-64, by Hughes Helicopters, over the Bell YAH-63 in 1976, and later approved full production in 1982. McDonnell Douglascontinued production and development after purchasing Hughes Helicopters from Summa Corporation in 1984. The first production AH-64D Apache Longbow, an upgraded version of the original Apache, was delivered to the Army in March 1997. Production has been continued by Boeing Defense, Space & Security; over 1,000 AH-64s have been produced to date. The U.S. Army is the primary operator of the AH-64; it has also become the primary attack helicopter of multiple nations, including Greece, Japan, Israel, the Netherlands and Singapore; as well as being produced under license in theUnited Kingdom as the AgustaWestland Apache. U.S. AH-64s have served in conflicts in Panama, the Persian Gulf, Kosovo, Afghanistan, and Iraq. Israel used the Apache in its military conflicts in Lebanon and the Gaza Strip; both British and U.S. Apaches have seen deployments in Afghanistan and Iraq. 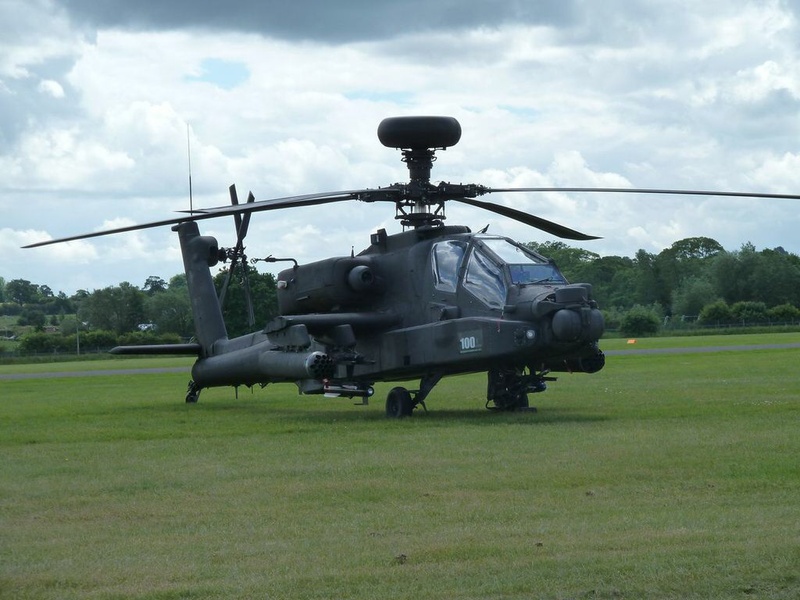 I have also seen some impressive demonstrations of theApache’s awesome capabilities at Cosford Air Show. International Blasphemy Day Takes place annually on 30 September Blasphemy Day is celebrated on September 30 to coincide with the anniversary of the publication of satirical drawings of Muhammad in one of Denmark’s newspapers, which resulted in the Jyllands-Posten Muhammad cartoons controversy among Danish Muslims, and became a widespread furor after Muslim imams in several countries stirred up violent protests in which Danish embassies were firebombed and over 100 people were killed in subsequent protests concerning the cartoons. As of 2012, anti-blasphemy laws existed in 32 countries, while 87 nations had hate speech laws that covered defamation of religion and public expression of hate against a religious group. Anti-blasphemy laws are particularly common in Muslim-majority nations, such as those in the Middle East and North Africa, although they are also present in some Asian and European countries. In some countries, blasphemy is punishable by death, such as in Afghanistan, Pakistan, Turkmenistan, and Saudi Arabia. As of 2015, at least fourteen member states of the European Union maintain criminal blasphemy or religious insult laws. These are Cyprus, Denmark, Finland, France (Alsace-Moselle region only), Germany, Greece, Ireland, Italy, Malta, Poland, Portugal, Spain and the United Kingdom (Northern Ireland only) Turkey also has similar laws. As of 2009 six U.S. states still had anti-blasphemy laws on their books: Massachusetts, Michigan, South Carolina, Oklahoma, Pennsylvania, and Wyoming, but these are unenforceable.